In Montreal, Amrit Kaur how it worked to CBC this morning; Valentine cards were made by children and young people from 6 to 14 years old at the Sikh Temple in Dollard Des Ormeaux, a Montreal suburb. Then some treats, such as body and hand creams, or bath balms and nail polishes, some of them donated, some bought with funds raised, were assembled. University students at both Concordia and McGill have been busy preparing the gifts for the last three days. And today, 52 of these gifts were distributed to 5 Women’s shelters in Montreal and one in neighbouring Vaudreuil. 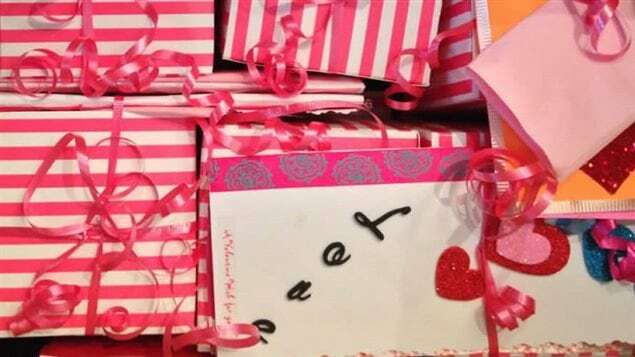 Amrit Kaur said organizing and distributing the Valentine gifts is in keeping with the Sikh principle of selfless giving. She notes that women in shelters are often neglected or forgotten and it can be a tough time of year for them. And Kaur says, the kids love participating in it, and the university students love the feeling of doing a good deed. It all began in 2013, when the World Sikh Organization and Guru Nanak’s Free Kitchen (GNFK) launched the event in Vancouver. The local Gurdwaras participated and served as drop-off locations. The response from the shelters was overwhelming. Many of the residents noted how difficult Valentine ’s Day can be when having recently escaped an abusive relationship. In 2014, it was expanded to Calgary, Toronto and Montreal in response to the tremendous support provided by the community.